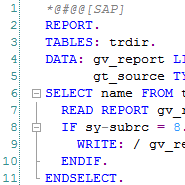 If you ever wondered, where SAP stores your report source code, you probably came across table REPOSRC – but the source code is stored in a compressed format, so there's no way to get hold of it directly. I've been trying to figure out, how this compression works for some time now… fortunately, several people dealt with the SAP DIAG protocol recently – which got me off the ground. The DIAG protocol uses a form of the Lempel-Ziv (LZ) compression algorithm and a bold attempt confirmed that this is also true for the source code compression. The code stored in REPOSRC-DATA is actually compressed using the LZH algorithm (Lempel-Ziv plus Huffman coding), which is used by the SAP DB MaxDB database too (thanks to Dennis Yurichev for the idea). The first 2 bytes of the decompressed source are junk, too ?! The decompressed source code has a fixed line length of 255 characters (blank-padded). Download this archive (it contains the decompressor tool compiled for Win32 and an ABAP report to dump the binary source code). The source code is available here; you can easily compile it on Linux/BSD/Unix/Windows using the enclosed build script. To extract the compressed source code from SAP, use the report "ZS_REPOSRC_DOWNLOAD". It reads the DATA field from table REPOSRC for a given report and stores it in a binary file on your workstation. Decompress the file on the command line. PS: Works for Kernel 7.x, no guarantee for older releases. PS 2: The functionality on non-Unicode systems is unknown… I'll check this later.